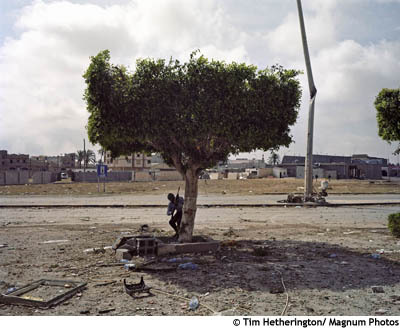 An exhibition of photography and multimedia work of photojournalist Tim Hetherington is on view October 22–December 2, 2011, at the recently opened Bronx Documentary Center (BDC). Visions: Tim Hetherington, the first exhibition of Hetherington’s final works since his death in Libya in April 2011, includes never-before-seen color photographs and video installations. Before leaving for Libya for the last time, Hetherington had conferred with BDC founder and photojournalist Michael Kamber about creating a gallery and educational space for documentary media in New York. The BDC was created after his death. Visions: Tim Hetherington is the BDC's inaugural exhibition.